When a massive ice jam smashed the bridge over the Loup River south of Columbus in 1886, the Platte County Supervisors immediately began considering a replacement. They held a special county-wide election to authorize a bond issue for the new structure, and then awarded a construction contract to George E. King of Des Moines, western agent for the King Iron Bridge Company. Consisting of four 250-foot through trusses, the Columbus Loup River Bridge was extensive, and King worked until October 1888 to complete it. The bridge carried heavy traffic, first as a county road, then the Lincoln Highway and finally on U.S. Highway 30, until its replacement with another truss in 1933. That August, heavy flooding washed out virtually all of the bridges over the Niobrara River in Sheridan County. The county commissioners purchased two spans of the Columbus bridge and hired the General Construction Company to erect them at the Loosveldt and Colclesser crossings south of Rushville. The county maintained the Loosveldt Bridge until 1984, at which time it was sold to the adjacent landowner. Now called the Budd Bridge, it carries traffic at the headquarters for the Budd family ranch. 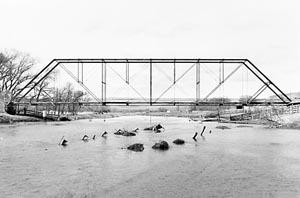 In its present location in the Sand Hills region, far removed from the Loup River of eastern Nebraska, the Loosveldt Bridge has lost the historical association of the original Columbus Bridge. But this structure is technologically significant, even in its new location. Although numerous wrought iron bridges were erected in eastern Nebraska in the 1880s, only a handful remain today. None are on the scale of the Colclesser or Loosveldt trusses. Built by a nationally prominent bridge erector, both structures are important to the history of bridge building in Nebraska for their representation of the state's earliest iron truss construction.